Abstract: Xigmatek continues the new trend of heatpipe stacking with its latest heatsink, the S128264 Aegir. The Aegir is an exposed heatpipe base tower heatsink made to accommodate one or two 120mm fans. Xigmatek continues the new trend of 'heatpipe stacking' with its latest heatsink, the SD128264 Aegir. The Aegir is an exposed heatpipe base tower heatsink made to accommodate one or two 120mm fans. A single 120mm 2200-1000RPM PWM fan is supplied with it, and judging by the excellent thermal test results there's really no need for a second... unless you're planning on operating both fans at the slowest possible speeds. For the uninitiated, stacked heatpipes are just that. In other words, above the bottom row of 6mm & 8mm exposed heatpipes that make contact with the CPU is a pair of 6mm diameter heatpipes. 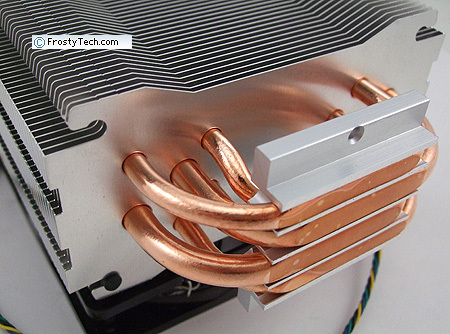 In total there are four 6mm diameter and two 8mm diameter heatpipes in this CPU cooler. 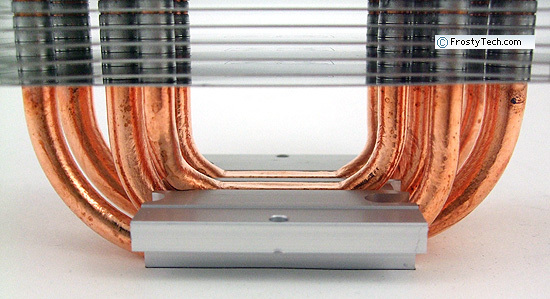 The heatpipes cover a swath just 32mm wide, rather than the extending beyond the dimensions of most processors as other heatsinks with five and six heatpipes often do. As you likely know, 'exposed base' or 'direct contact' heatpipes allow heat energy to be efficiently conducted from the CPU to the aluminum fins by omitting an intermediary heatspreader. The additional layer of thin heatpipes on top of the primary set theoretically takes up the slack by conducting some of the heat absorbed by the aluminum base structure that supports all the heatpipes. Standing 160mm tall, Xigmatek's SD128264 Aegir heatsink tips the scales at 670 grams and has a rather slim footprint of 130mm x 94mm. It accommodates one or two 120mm fans that mount to the fins with special rubber vibration absorbing posts. 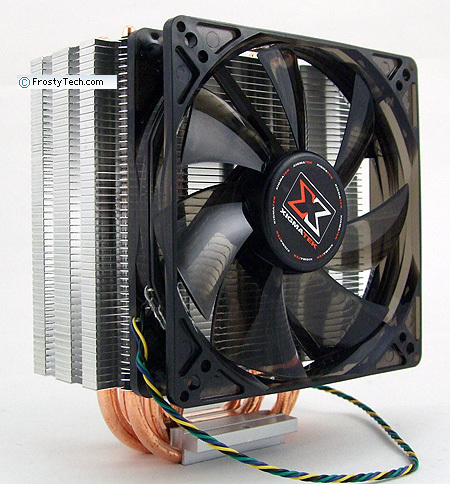 The heatsink can be installed onto Intel socket 775/1155/1156/1366 and AMD socket AM2/AM3 processors. Retail price is approximately $58 USD/CDN through the usual online computer stores. Xigmatek opt for two 6mm and two 8mm diameter copper heatpipes swagged into the heatsink's aluminum base block, as you can see below. In the slim space between each heatpipe, some heat is conducted to the additional 6mm diameter heatpipes that are tucked in above. Exposed heatpipe base heatsinks work best with processors that have a thick integrated heatspreader and even heat distribution over the entire CPU IHS surface area. They can encounter problems when heat is localized too directly, such as if only one or two heatpipes receive the bulk of heat from the CPU. Generally speaking, the four bottom heatpipes ought to have sufficient capacity to conduct heat from a 150W Intel/AMD processor to the aluminum fins of the Xigmatek SD128264 Aegir if the heatsink is designed properly. The notches pictured above are for the rubber fan tabs to latch into. Xigmatek rely upon the same little rubber posts for all of its heatsinks. The fan is also illuminated with a couple tangentially located white LEDs. Personally, we prefer wire fan clips with some sort of elastomer between the fan and fin tower. I'm afraid of ripping the rubber posts during repeated fan installations, or several months down the road for dust cleaning. Xigmatek's SD128264 Aegir heatsink is compatible with Intel socket 775/1155/1156/1366 and AMD socket AM2/AM3 processors. 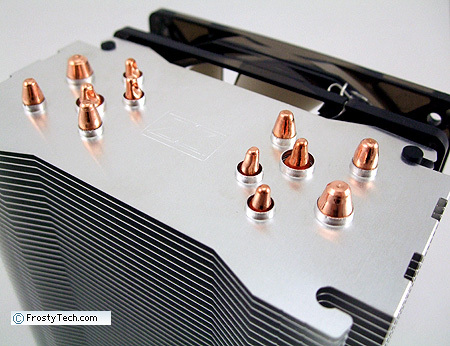 The heatsink comes with one rear metal support bracket for Intel/AMD boards that will require access to the back. Depending on the case you may need to remove the motherboard to install this heatsink. After the upper metal stand offs are installed, subsequent CPU swaps are much more straightforward. AMD platforms make use of the same basic heatsink brackets, which is a shame since AMD supplies a heatsink retention cage on every single board. 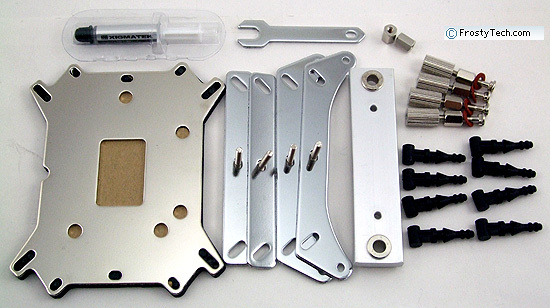 Again, get ready to remove the board from the case and install a rear support plate and top metal stand offs. Ugh. Instead of wire fan clips, Xigmatek opt for rubber vibration absorbing posts which tie into the fins to hold a 120mm fan in position. 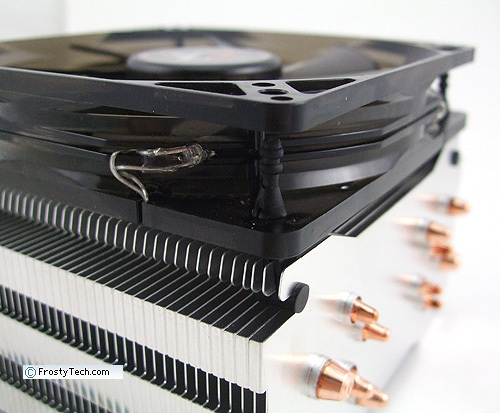 One or two 120mm fans can be mounted to the heatsink (second fan not included). List all Xigmatek heat sinks that Frostytech tested?